I am headed to Las Vegas for a big social media conference so that means I will spend Valentine’s Day without my Valentine’s in the most romantic city in the world. 1. Wedding preacher dressed as Elvis. 5. Bride smoking a cigarette holding one of those 3 foot long drinks. 6. Couple over the age of 70 getting married. 7. Couple getting married where it is likely they have not known each other more than 24 hours . What else do I need to add to my scavenger hunt? And what should the prize for the winner be, especially since i will be the only one playing? I have a very simple rule when it comes to food. I do not like, and will not eat, food that explodes in my mouth. What, you ask, is food that explodes in your mouth? Any food that when chewed dramatically changes shape or form with the first chomp or squishing between teeth is a “food that explodes in your mouth.” Yes, I know that all food changes form and shape when getting chewed, but this change should naturally happen over the course of a few chews, not in the first explosive chomp. I am not sure if it is the texture or the change or the “hey, here’s another texture or taste you did not expect” surprise that causes this issue for me, but whatever it is I DO NOT LIKE IT. The key offenders in this category are peas and those little tomatoes. Ever since I ate my first pea in a $.29 pot pie in the third grade, I have had an issue with exploding food. Just the mention of both of these in the same sentence gives me a nervous chill into my scalp and a bit of throw up in my mouth nausea. And it just dawned on me, but if I were to ever somehow get both a pea and tomato in the same bite, I am pretty sure I would end up hospitalized. Or explode myself. So if you ever see me anywhere near a pea or a tomato, please in the interest of public, take them and smash them into a million tiny pieces. Then you can shove them in my mouth. There are four women at my house. Which means, since we have had no unfortunate run-ins with lawnmowers or alligators, that there are eight female feet at my house. Which also means that at any given time there are about ten thousand shoes laying in the floor somewhere in our house. Why are there so many shoes on the floor? 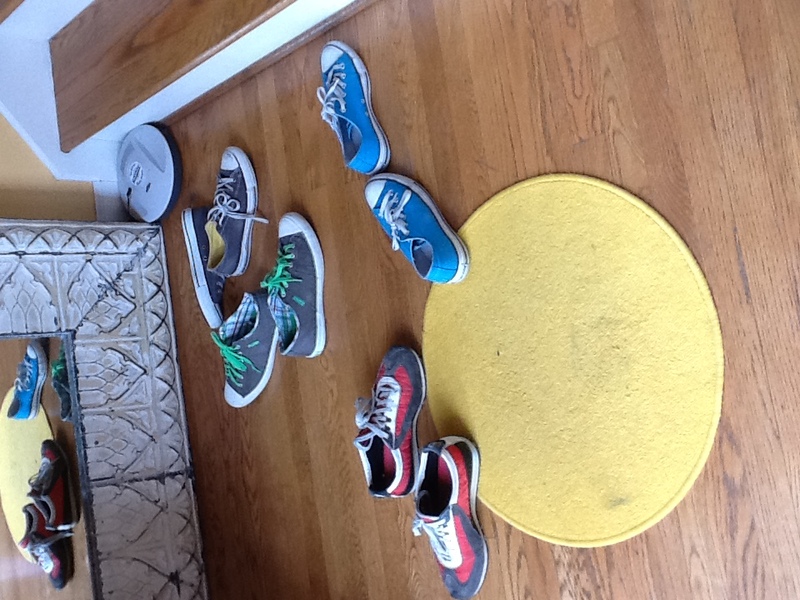 The question of the plethora of shoes dotting my floor has plagued for years. I have so many questions and so very few answers. Why is it impossible for anyone else at my house to pick up their shoes? How many shoes do they need to wear in a day? Did Chuck Taylor ever imagine that his ubiquitous shoes would end up as a fashion statement for teenage girls? Do teenage girls have any idea who Chuck Taylor is? Is the flood of shoes really an Old Testament plague that just came a few thousand years too late? Are there shoe fairies that come out and night and scatter shoes about the house? How did a shoe end up on top of the refrigerator? Never mind, don’t answer that, I don’t want to know. If I gathered up the shoes that do not make it to a closet before bed every night, now long would it take until someone noticed that shoes were missing? Why do we keep buying shoes? Surely there can’t be any more colors or shapes or sizes that we do not have? First ever guest writer for Jeff Atwood’s blog… Nah. It’s weird to call him Jeff! This is Macie, or you might know me as Butter. Yup, that’s me. First ever guest writer on this blog! That’s more like it… The other night I went to Madison’s Best Buddies Prom, that’s the reason my dad had me come write here! The prom was at a Marriot in Nashville and it was very nice! To get to the room in which it was literally held you had to walk up some stairs and down a long red carpet while people took pictures of you like paparazzi. The actual dance was in a dark room, surprisingly music blasting from loud speakers. There was a live band and they had people from each school sing karaoke. There were a few tables with dark table clothes, small colored stones, and candles. There were some spotlights and couldn’t help joke about hoping there was no strobe lights. There were so many people there! 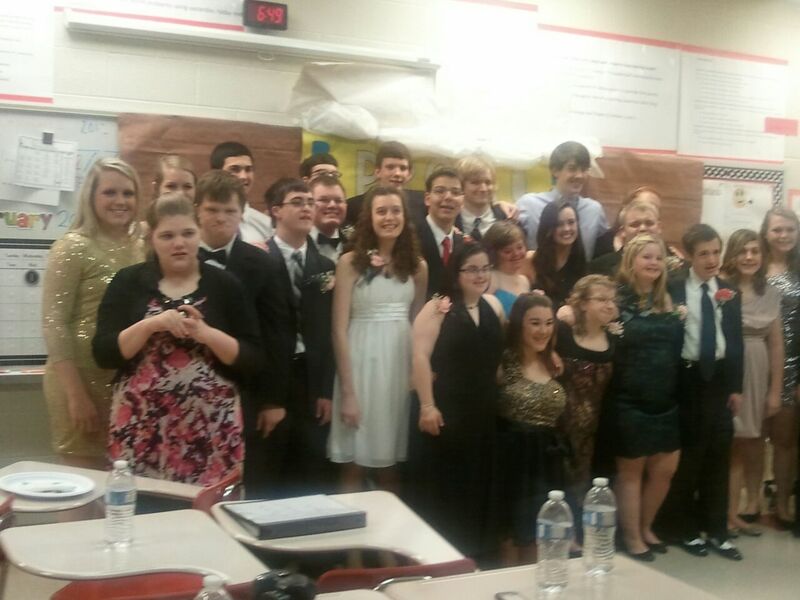 This was because it was the prom for all of the Best Buddies programs of middle Tennessee. Every participant was so sweet and every buddy could not be nicer! There were beautiful dresses and tuxedos everywhere you look. There were also snacks available. It was an amazing night! Although it was such a great night Madison didn’t want to do too much. This was because she didn’t want to dress up, it was loud, and some overall feeling that I think she doesn’t even know. She basically wanted to go to dinner before and get this year’s valentines, which we did. Then after that, we stopped by the dance to say hi to friends. She went in the room for a song to dance and hang out. However most of the time Madison stayed in the hallway where it was quieter, but where she could still dance. The Best Buddies Prom was such an amazing night! The people there, the karaoke, the dancing, the red carpet, it was all so moving and magical! Madison, my mom, and I had a great time on our night out. My sister loved getting to hang out with her friends and dance with her best buddy Holly. It was a great night and I think we all look forward to it next year. I am a simple guy, with simple needs. I like simple food like mashed potatoes. I watch simple shows on TV. I am most comfortable in jeans and a sweatshirt. And I do not wear any jewelry other than a wedding ring. I think this is because I lived in Iowa as a kid. And Iowa is a simple state. That said, living with four women can complicate life.In lots of different ways. The one that has become particularly clear is in the area of hair products. And there’s the thing. Shampoo is expensive. Almost as expensive as rocket science I think. I just need my hair to not look like a pack of opossums just settled in for a long winter’s nap. I don’t need it to smell like a bouquet of wildflowers plucked from the island nation of Bora-Bora. But no, because I live with a house full of women, I am destined to have hair that is over-producted, and way prettier, smellier, and un-simple than I deserve. It’s like my hair needs a Chevrolet, and my shower is parked full of Corvettes. We have two dogs at the AtwoodZoo. We have Boomer the curly-brown-haired-Muppet-looking amazing dog. And we have Charlie. And he is certainly not amazing. Charlie is a dog The Beautiful Bride and the girls rescued from Happi-Tales. I have wanted to “Un-Rescue” him any number of times since he came home. And just like in the show, the pitiful one found a home. Our home. Where Boomer the Awesome Dog reigned the palace and exuded love and happiness with every breath he took. Charlie, on the other hand, peed on the floor. And in spite of my many misgivings, I have however, found Charlie useful for two key tasks. He is awesome at cleaning out the car. Every couple of weeks I put him in the backseat where the girls have eaten a fair amount of “I need to eat something while I go from here to there” meals. And as kids, will do, a fair amount of that food ends up on the floor or between the seats or stuffed in the cushions. This is where Charlie comes in. We are not exactly sure what kind of dog he is. He is one of those “All of the above” kind of dogs. And I think that part of the “All of the above” is anteater. Because he has a proportionately GIANT tongue. I am talking freakishly long. He can sniff out food no matter how old or decrepit, jam that monstrous tongue into any crook, cranny, or crevice in the car, and pull back a month-old chicken tender and a mouthful of mostly fossilized French fries. It is amazing what kind of food particles he can find. And because of this unique and frankly very helpful skill that he has become tolerable. He has one other important trait that makes him acceptable. See Boomer has a bit of a sensitive stomach. And as a result he tends to….well…re-share his food. All Charlie has to hear is Boomer start to hack a bit and he is a like a heat-seeking missle moving throughout th house looking for his best friend Boomer. Charlie is not a dumb dog. He is a funky, often nasty dog, but he is not a dumb dog. Because he knows that when he finds Boomer, his reward is even better than what he finds in the car, for now the hand-me-down-food is pre-heated. Top 10 Reasons I think it’s great that the church we got married in is being turned into an Amusement Park. In 1992 The Beautiful Bride and I got married at what was then Two Rivers Baptist Church. I rocked a mullet, she had hair as big as the great outdoors, and we were crazy in love. Now almost 20 years later nothing has changed. And the fact that it looks like the church we got married in is soon going to be turned into an amusement park. Many may mourn the downfall of the old church, I think it is great. In fact, here are the Top 10 Reasons I think it’s great that the church we got married in is being turned into an Amusement Park. They have a built in dunking booth. At least it’s not getting turned into an outlet mall. Aren’t a lot of preacher s just really glorified carnival barkers anyway? The park mascot could be The Church Lady. Madison had been looking forward to this day for weeks. She was as excited as can be. And because she was excited, I was excited. But I was nervous too. Because so many thins could go wrong. She could get nervous and not want to play. She could get overwhelmed by the noise and the kids and the everything else. She could have a bad seizure. She could run up to kick the ball and miss and fall down. And kids could laugh at her. She could step up to the plate, check things out, catch her breath, look to her “Best Buddy” standing to her side, and then run up, kick the ball and hustle down to first base. With a smile as big as can be. I have been to a Super Bowl. I have been to a Final Four. I have been to All-Star games and Playoff Games and I was there for the Music City Miracle. They all pale in comparison to the game that will be played today. 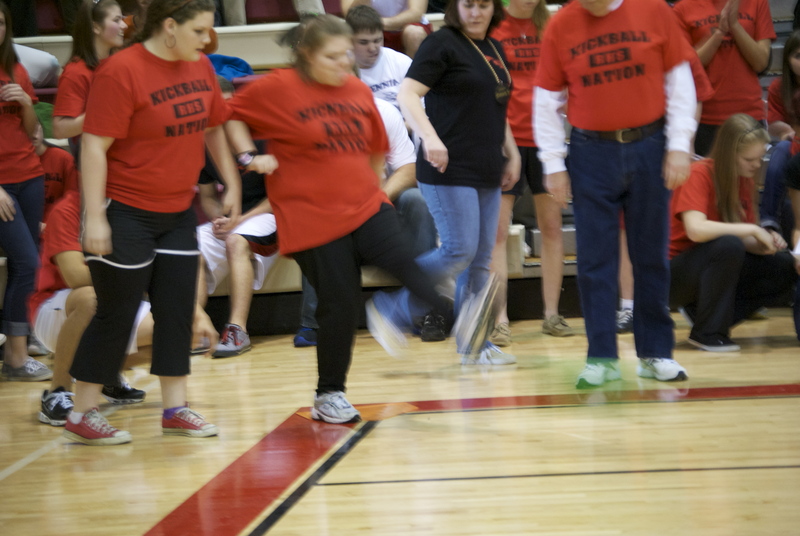 Because today the Special Ed class from Ravenwood will play the Centennial High School Special Ed class in kickball. And the whole school will be watching and cheering. Watching and cheering for kids who hardly ever get the cheers that the football team does or hear the applause that the kids in the musical hear. This is the day that the kids in Madison’s class have had circled on the calendar for weeks. They have practiced and practiced and practiced their hearts out. Every day for a week Madison has asked if I’m going to take pictures. “you need to take a hundred pictures of ‘the friends,’ she says. And I will take pictures. At least a hundred. Of all the friends. Because today for at least an hour, the kids who spend so much of their life on the sidelines, will be center court superstars in The Biggest Game of the year.